So I stopped at the new gas station/convenience store on the way home, and after filling up the car’s tank, decided to fill my own, and went inside to pick up two bottles of drink-me-now wine for us. First I selected a Kendall Jackson Chardonnay, which I was surprised to see there, even at $13.49 for the always-dependable bottle. And now for a red. Hmm. Nothing there I hankered for, so I went to the small selection of Chilean wines from the Cono Sur winery. The name, which means Southern Cone, refers to the southern region of South America. I figured a bad Merlot would be better than a bad Cabernet, so I picked up the $7.49 bottle of Merlot and took it with my KJ to the cash register. Upon opening the screwcapped bottle, I.Was.Really.Surprised. This modestly priced bottle has as much character as any wine I’ve had all year. Ripe, big fruit with violets and bright soprano cherry notes. I knew immediately it was a blend. (In the U.S. as long as a wine is 75% anything, i.e. Merlot, its label can describe it as, simply, Merlot.) I figured it had Grenache in it, but no, it’s 85% Merlot, with 7% Cabernet, 5% Malbec, and 1% each Petit Verdot, Carignan, and Alicant Bouchet. The Web site says this wine was aged for 8 months in stainless steel, yet refers to “toasted oak” in their notes. I didn’t have that perception, but perhaps the lack of heavy-handed oak in this wine is part of the reason it appeals to me (it’s refreshing to leave the word “molasses” out of my description), besides my love of florals. Winemaker: Matías Ríos. This is a surprisingly good wine at a great price. LABEL: The Cono Sur vineyard workers travel around our estate by bicycle, tending the vines using natural methods, in order to produce the best quality grapes. 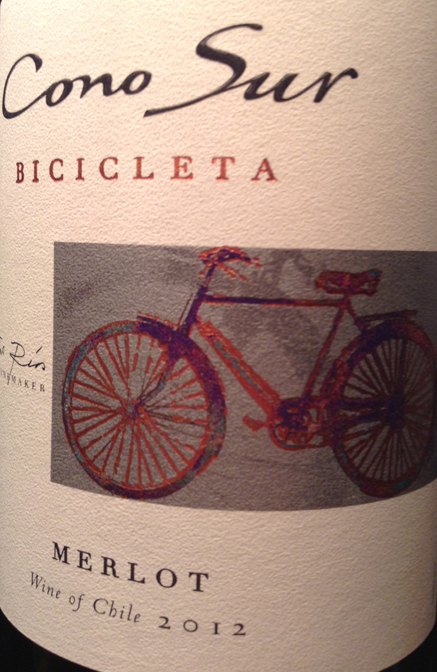 Our Bicicleta wines are a tribute to them. WINEMAKER’S NOTES: A dark plum red Merlot with blackberry, chocolate and lightly toasted oak aromas together with a ripe, fruity palate. This entry was posted in Alicante Bouschet, Cabernet Sauvignon, Carignan, Chile, Malbec, Merlot, Petit Verdot. Bookmark the permalink. Haha! Great shot of the label and glad to see you back wine blogging! And yes I know nights like that one! Very true that you can often get a better value in wine from So America, and merlot can be an unappreciated gem. A little of those blending wines can go a long way toward providing needed complexity and color. However, I hate to think that those “oak” notes were added by chips which would also explain the inexpensive price. PS Are you going to WBC14? I won’t be coming to WBC14, because another trip overlaps it. Sorry to miss another year — I’m thinking I’ll go ahead and book WBC15 as soon as it is announced, as it has been too long since I’ve seen you and my other wine writer friends. I doo believe I drank this wine in Ecuador and was also pleased wioth its quality and price. I must confess, however, that IO despise KJ Chardonnay, which a girlfriend I had in Southern California always insisted on buying, in spite of my objections and wullingness ro spend $40 + for a good chard; KJ is so acidic that it invariably causedme to have acid reflux the night after drubking it.